Whether you are a regular in the show ring or loving pet owner, your pets will look their best when using the hypoallergenic 1st In-Line products! Check out the reviews below. Exhibitors and handlers such as Kelly Fitzgerald, Linda Pitts and Clint Livingston use this product also and are overjoyed with the results. 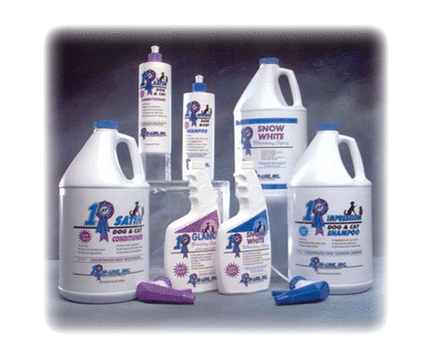 Their Multiple Best In Show winning dogs demonstrate that this product works! Snow White Whitening spray is the key, the magic, the solution to glistening white coats! Let me tell you another secret: this product line is NOT just for dogs! Any equestrian knows how difficult it can be to make those white socks glistening white or that palomino mane sparkle. Apply the spray, and brush or wipe off. The stains and blemishes vanish! Your scrubbing time has just been cut in half! We use it, we love it...see how beautiful and white my dog looks. From our Facebook community .. Washed Joy Tuesday with the products & 2 folks wanted to know what shampoo I used, 2 new customers Judy Yah!!! I LOVE these products, been using them for several years on my sammies, and I always get great compliments on how well conditioned their coats are,how white, how soft, yet correct their coats feel. Rinses out easily, smells great! Join us on Facebook for updates, usage tips, and a great community of 1st In-Line users!